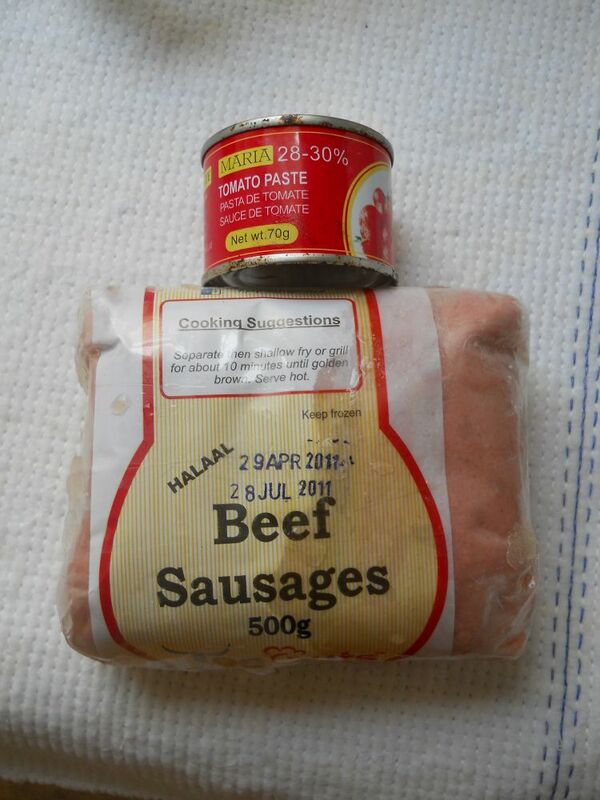 Tiny hot dogs and a tiny tin of tomato paste! 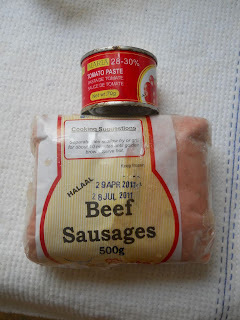 My initial plan was to make a meaty pasta sauce with the help of an onion and some tomatoes, but now I'm wondering if I shouldn't just fry up some bangers... decadent, I know. 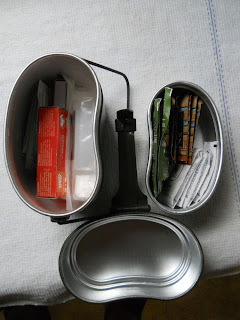 One standard issue Norwegian Mess Kit - based on a German design - all packed and ready to go. 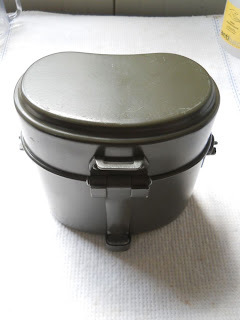 The nice thing with the mess kit is that it also fits a fair bit of things inside. Back when I was in training, the mess kit was a favoured place to store dry socks and underwear... here in Sudan I use for for a few survival items. 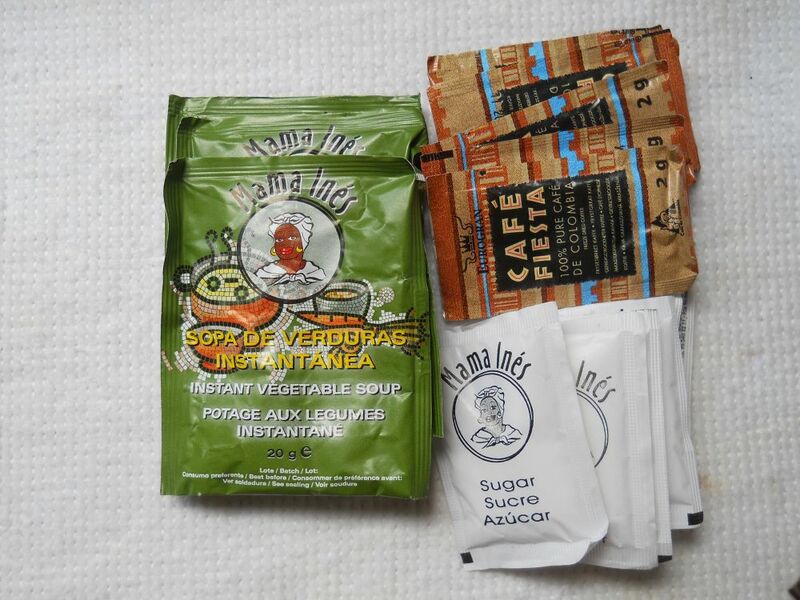 Three bags of instant soup, six satchels of coffee and six of sugar. Enough go-juice to keep me alive for a day or two in a pinch. 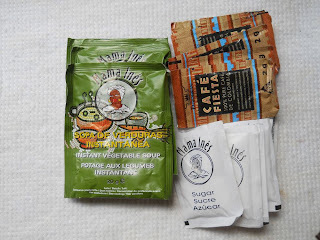 I decided to go for bags instant soup in my "go kit" instead of a dehydrated dinner simply due to the fact that soups can be drunk - thus no need for bringing a spoon. 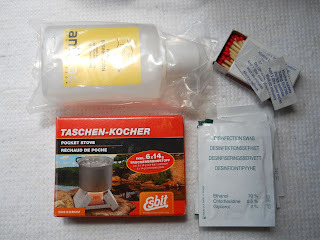 In the bottom store the things to help me prepare the food: A bottle of hand sanitizer to clean my hands before cooking, a small Esbit stove, matches, water purification tablets and disinfection swabs to clean out the mes kit with. 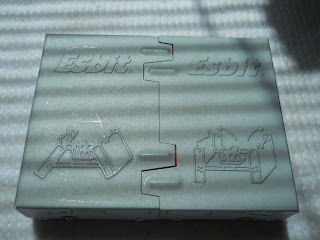 The Esbit stove is extremly handy - not much larger than a deck of cards, it none the less allows me to boil water with ease. The stove folded out for use. It has two settings; High (shown in picture) and Low (see next picture). Each tablet burns for about 12 - 14 minutes, and according to the blurb it'll boil one liter of water in seven minutes. 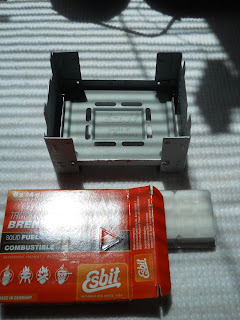 And the stove have storage space for six tablets... that translates to 12 liters of boiling water. Pretty amazing for such a tiny package. 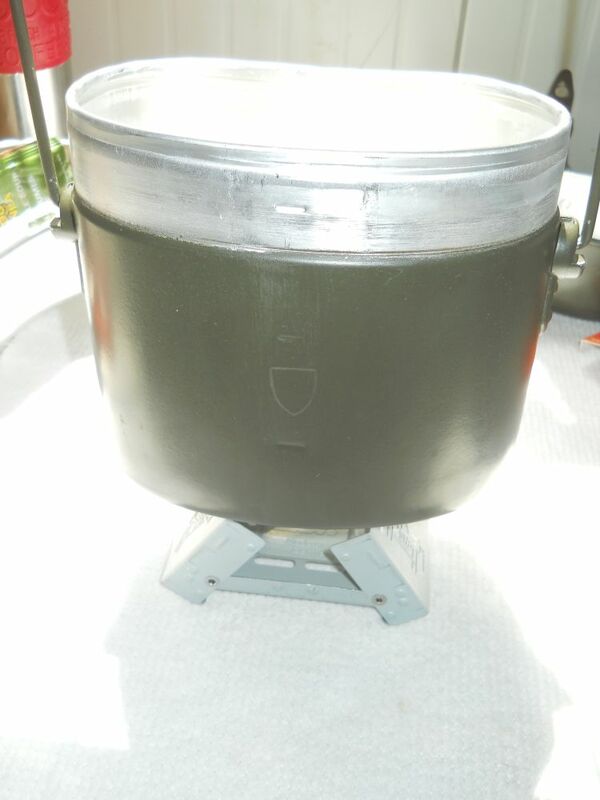 A dry run of boiling water on the low setting. By boiling the water in the bottom of the mess kit, I can make soup in the insert and a double coffee in the lid. Rinse and repeat as necessary. Naturally I hope I never have to break out the mess kit while on patrol - but I always have it close by when I'm away from the Team Site. That mess cool is interesting. o.o Never seen anything like it here.